Across the ages roams an immortal troupe of actors, gifted with fantastical powers and led by a mysterious artiste with a penchant for meddling. Wherever they roam, they encounter magic and monsters and evil that requires taming. 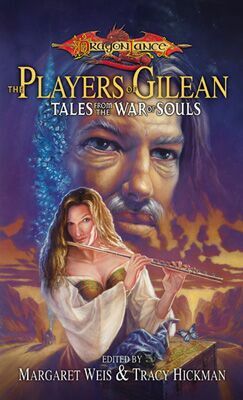 This is the first anthology based on characters from the extraordinary novella "The Traveling Players of Gilean", by Margaret Weis and Aron Eisenberg, which was featured in The Best of Tales, Volume One. This new anthology also features novellas by best-selling Dragonlance authors Douglas Niles, Richard A. Knaak, Paul B. Thompson, and a new collaboration by Jean Rabe and Aron Eisenberg.